At first glance the instrumentation of Duo FreDo is quite classic with piano and flute – anything but traditional, is its repertoire with compositions from the recent past. 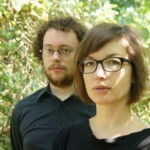 Doris Nicoletti and Frederik Neyrinck have made their marks in contemporary music as members of renowned ensembles, however as a duo they have just recently come together. As a duo they embark on a search for the extension of sound, bringing their instruments beyond conventional concert forms into installation-based contexts and combine music with other forms of art. They extend existing repertoire with commissioned compositions and supplement material for their duo with creative adaptations of solo works.